Tigger rocking & rolling, showing off her tummy and all her fur colors! No, we didn’t think we had a Calico rabbit. It is though what quite a number of people said when they first saw Tigger or a picture of her. We didn’t know how to describe her either at first. We knew Calico wasn’t right as that was a cat breed and not a striped pattern, but what breed of bunny was our Tigger? I had attended quite a number of county fairs growing up without ever seeing a rabbit like Tigger. I also had a number of rabbit books I had accumulated, but looking at them I didn’t see any bunnies that looked like Tigger. While looking in some newer rabbit magazines, I did see some rabbits that looked like her. 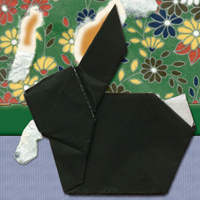 I hit the Internet looking for more information on the Harlequin rabbit with Japanese coloring. At first I thought bingo, that is our Tigger bunny, until I read that the Harlequin rabbit is around nine pounds. Even though Tigger was still growing, it was pretty obvious from her very dainty ears and paws that she wasn’t going to be a nine pound rabbit. Full grown she ranged from 4.5 to 5 pounds and chubbed out a bit late in life to 5.5 pounds. So early on, it was obvious that she wasn’t full-blooded Harlequin. We called her our half-pint Harley. 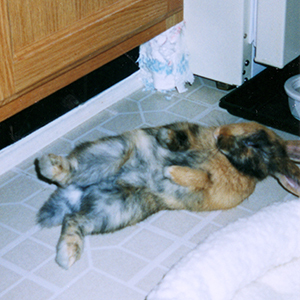 During the first year we had her, I read in a rabbit magazine that some breeders were trying to create a mini Harlequin rabbit and figured it was quite possible with her beautiful coloring and small size that Tigger might have resulted from such a plan. It was a guessing game for us wondering what other breed/s might be in her genes. Full grown, when Tigger would lay stretched out, she was quite long and skinny. Reading about all the different rabbit breeds, we wondered if she might be part Himalayan rabbit. The Himalayan breed is small in size around 2-4 pounds and known for a very long snakelike body. So was Tigger part Himalayan? Perhaps. However, Harlequin / Himalayan didn’t totally track with her personality. I had read that Harlequins and Himalayans were known for having calm and easygoing personalities. Tigger was freakazoid and sassy beyond belief. However, I also read that Harlequin’s enjoy attention, are curious and love to be the center of attention. Tigger was extremely curious. She just had to be in to everything. She also truly loved attention. If I brought a camera out, she would pose. Later after we got Shadow, if I was taking pictures of him, she would hop over and take over the photo shoot. If you are ever trying to figure out what breed of bunny you might have, a place to start can be the rabbit breed categories established by associations in your country. For the US the American Rabbit Breeders Association’s Recognized Breeds provides a lot of pictures and links to breed profiles with information on the size, coloring and fur of the different breeds. Now if you really love pet rabbits, do not make the mistake of actually joining any of the breeder organizations. Been there, done that oops and don’t want to read about rabbits being raised for fur or meat. We will never know for certain what exact mix of rabbits lead to our Tigger, but we always figured she was one of a kind. That led to our enjoying her company to the fullest, because we always figured once she was gone that there would never be another bunny to come along that would be just like her. Sometime in the future, when we decide to bring another rabbit home, we won’t be expecting one like her, but will be looking to learn what one of kind bunny they are. Rabbits are such an adventure to get to know, because they all have such unique characteristics and personalities! Coming next: So how many chins does a rabbit have?